Both Japan and Senegal won their opening encounters against Colombia and Poland respectively, and a win today would have all but guaranteed qualification for the last 16. Senegal started the stronger of the two teams. Mbaye Niang, and Ismalia Sarr in particular caused trouble for Japan, who were struggling to make an impact on the other end of the pitch. Japan goalkeeper Eiji Kawashima had his second howler of the tournament in gifting Sadio Mane his 11th minute opener. Also at fault for Juan Quintero’s goal in their win over Colombia, he punched the ball at point-blank range into a grateful Mane. Senegal continued to have the better of the run of play, without really taking advantage of their superiority. They were made to pay with ten minutes left in the half. Despite a poor first touch in the box from Yuto Nagatomo, the former Inter Milan veteran was able to set up Takashi Inui, and amid indecisive Senegalese defending, Inui tucked it home with a fine finish. Awoken from their slumber, Japan took the initiative and levelled out the quality of play heading into the break. Niang had the best chance of the remainder however, opting to use the outside of his left foot when approaching from the right, as opposed to lifting it over the on-rushing ‘keeper with his right. 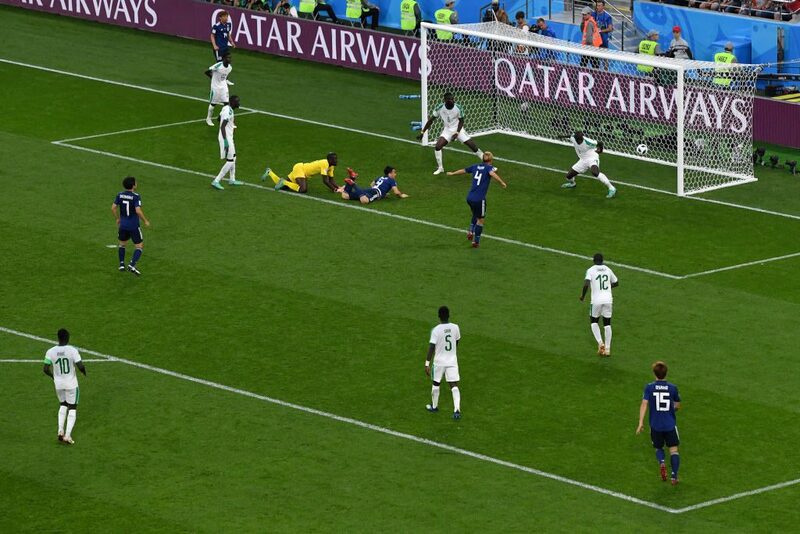 Aside from a poor close-range header from Yuya Osako, Senegal looked more likely to add a second after the restart, though some of their form in the attacking third did look uninspiring. Shinji Okazaki was likely in despair on the bench at the hour mark. Some fine build-up play saw Osako completely miss the low cross from less than six yards out. He may have scored the winner in the opener, but this wasn’t his day in Ekaterinburg. Inui hit the crossbar, and in the course of his many defensive duties, brought down Sarr just feet outside of the right of his own box. A ill-judged ground pass that came nowhere near Gana Gueye seemed to sum up Senegal’s quality in front of goal to that point. Just afterwards, full back Sabaly turned in the Japanese box, hit it across the goal with a flick off Niang into the path of Moussa Wague, who smashed it with aplomb. Japan responded by bringing on Leicester’s Okazaki, and with 13 minutes left, he was in the heat of the action for Japan’s second equaliser. Keeper Khadim N’Diaye flapped at a high ball, with Inui setting up Keisuke Honda as N’Diaye and Okazaki scrambled to respond. To their credit, both teams weren’t content with a point and pushed for a winner late on, but the game ended 2-2, meaning that Japan and Senegal top group H on four points each. They will eagerly await tonight’s tie between the point-less duo of Colombia and Poland, where another draw would suit them a great deal.